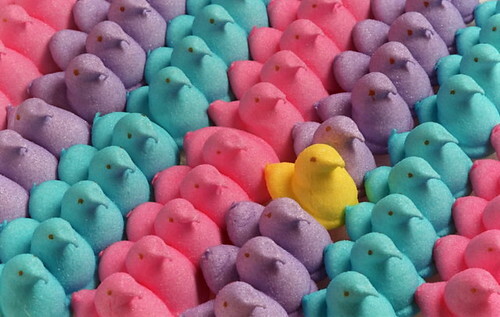 Since Easter Sunday I’ve had about a box of peeps a day. I am seriously addicted and I can’t help myself. I should be dumping them in order to not have them at my finger tips but the sad thing is…. I don’t wanna stop! I want to keep eating them and am finding new and inventive ways of enjoying them. I’m making smores with them and even found that if you take a bite of a peep and throw a coconut hershey kiss in your mouth at the same time it is die-licious! I have pink, blue and yellow. My minor O.C.D comes into play when I eat a pink and a blue, then feel like I need to eat the yellow in order to be fair and not play favoritism LOL. Thank you all for taking the time to read this totally random vent session! I hope I haven’t revealed too much of my craziness to scare you all away!